Saturday's Youth Defense march in Belfast saw a WSM member arrested for protesting the presence of Michael Quinn, the fascist who told the Sunday World that he would "he would have "no problem" with an Anders Breivik style-massacre" in Ireland. When Quinn was pointed out to stewards on the so called 'Rally for Life' they protected him and allowed him to continue on the march. On Sunday Youth Defence deleted posts of the picture of Quinn on the demonstration from their Facebook page and banned people who posted the picture or demanded to know why they had allowed Quinn to march. One woman described how "I posted up a picture of Micheal Quinn from the Belfast rally on the Youth Defence page. One person replied going something like 'that is a massive generalisation' and before I could reply, by posting up the youtube of his racist rant my post was removed and I was banned from posting on their page. They seem to be particularly sensitive about people revealing Quinn's presence as I had previously posted a link to the Danish survey on mental health and abortion which was not removed and is still rumbling away according to my alerts." Image: Quinn on Saturday's march wearing the logo of his tiny fascist DRM group. A member of Anti-Fascist Action Ireland, who has been following Michael Quinn's entry into far-right politics since 2010, posted the same image to the Youth Defence page and was also then banned. "I wanted to alert their supporters that long-term YD activist Michael Quinn is now a self-confessed and active White Nationalist and has been building links with Irish neo-Nazis, formerly of the group Celtic Wolves, and Greek fascists from Golden Dawn. For my trouble, my post was deleted and I was banned from the page." Other people also contacted us to tell us their posts on the same topic had also been deleted from the page. So what are Youth Defence trying to hide and what does it tell of the real nature of the 'Rally for Life'? The Sunday World article revealed that "As the news of the sickening Norwegian terror attack broke last week, DRM chief Quinn (51) took to the web to broadcast his sickening support for the murders." The article then went on to point out that "Fascist Quinn ran for election in Dun Laoghaire in 1992 as an 'Independent pro-life' candidate but failed to gain popular support. He went on to become a supporter of Justin Barrett, the anti-Nice treaty campaigner disgraced over alleged links to European neo-nazis . Barrett and Quinn were arrested at a violent anti-abortion picket of a Dublin hospital in 1999 but the charges were later dropped." 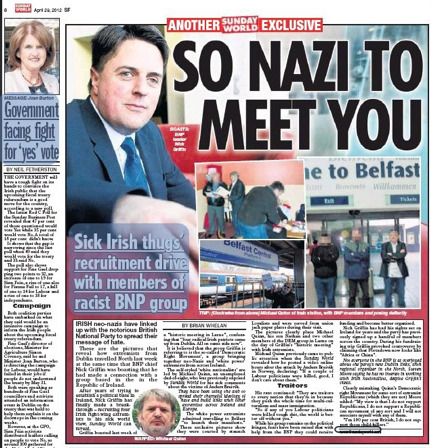 Another Sunday World article sub headed "Sick Irish thugs' recruitment drive with members of racist BNP group" published April 29 2012 revealed that Quinn had previously travelled to Belfast to meet with the far right British National Party and loyalists. The "Rally for Life' was otherwise the standard march of the religious far right determined to continue the regime which makes it possible to criminalize Irish women and doctors. The organizers pulled their usual branding routine of having young women carry the front banner but apart from this banner and a couple of other 'created to be photographed' clumps the march was overwhelmingly composed of religious fundamentalists, men, women over 50 and young children. In other words almost no one on the march was someone who might find themselves pregnant in the near future yet all were determined that a women with a crisis pregnancy should not be allowed to decide themselves whether or not to continue with it. Many of those marching thrust rosary beads into the faces of those on the counter protest or waved religious placards. Many of the older men were either wearing priests collars or were wearing the standard priest black shirt with the collar removed. (Facebook album of photos from the march). The anti-choice march seemed quite a bit smaller than last years march, despite the massive amount spent promoting it and running coaches to it from all over the island. On the other hand the 'organised on a shoestring' counter rally had grown in numbers in comparison with that last year with as many as 300 taking part. Those attending included a coach load of pro-choice campaigners from Dublin who had been moved to action by the shocking Youth Defence billboard campaign aimed at traumatizing the tens of thousands of Irish women who have had abortions abroad. As we previously reported women outraged at these bill boards have torn many of them down, splashed them with paint or covered them with counter slogans. All this in the context in the south where the Labour Party seems so scared of Youth Defence that rather than legislate for abortion in the very limited circumstances of the X-Case judgement they voted down a Dail bill to do just this and are hiding behind seeking a report from yet another committee. This 20 years after the X-case and after all previous governments have either tried and failed to overturn this judgment in referenda or also hidden behind getting reports from committees. This pathetic situation has gone on far too long, every day women are forced to make the difficult and often expensive trip aboard for an abortion or risk using medication ordered off the internet to self-induce an abortion at home. Youth Defence have been crowing about their success in stopping legislation being passed under the weird '100,000 babies saved' slogan. Weird because in reality about that number of women in Ireland have obtained an abortion since 1992 through travel or self inducement. Women have not been prevented exercising choice by Youth Defence, its just been made much more difficult for them. It's time Youth Defence were stood up to, their constant campaigns of shaming and traumatizing women ended and abortion made available, free and on demand as part of the Irish health services north and south.